Before Mark came along, I was nearly a vegetarian. But Mark is a carnivore --- if he doesn't get his red meat at least once a week, he goes stir crazy. In fact, I've found that farm work goes a lot faster if I feed him meat at least every other day. So, how do you put a chicken in every pot during a recession? 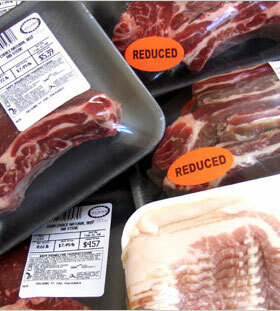 Head to your grocery store and check out the reduced meat section. If you get there soon after a batch of meat has been marked down, you can bring home quite a haul for as low as a dollar a pound. Toss it all in the freezer immediately and you can thaw it out at your leisure for the rest of the week. It is perfectly safe to eat reduced meat as long as you don't let it sit around in your fridge for another few days first. Finding reduced meat can turn your grocery store schlep into a fun adventure. We've discovered that reduced meat is most copious around holidays like the Fourth of July and Thanksgiving, but you can also talk to the guy behind the meat counter and find out when he's likely to mark meat down. I estimate that we save about $200 to $300 on meat every year by catching bargains. Want more in-depth information? Browse through our books. Or explore more posts by date or by subject. About us: Anna Hess and Mark Hamilton spent over a decade living self-sufficiently in the mountains of Virginia before moving north to start over from scratch in the foothills of Ohio. They've experimented with permaculture, no-till gardening, trailersteading, home-based microbusinesses and much more, writing about their adventures in both blogs and books. Want to be notified when new comments are posted on this page? Click on the RSS button after you add a comment to subscribe to the comment feed, or simply check the box beside "email replies to me" while writing your comment. The best way to save money on meat is to either kill your own wild meat, such as deer, turkey, squirrels etc or buy meat from a local farmer. I bought an entire cow last year that was organically raised, on grass not corn, and had never been given any antibiotics. It was a $1.25 a lb including processing. I do not trust that factory farmed antibiotic injected, water solution injected and color enhanced stuff passed off as meat in grocery stores. You're completely right on all those points! We want to start hunting, but don't have the skills yet. Mark's aunt buys half a cow every year, pre-butchered, and I'm always envious --- we need to make the contacts and do that! Ian --- One data point doesn't seem like enough information to give up on a food source. I generally believe in trying things multiple times and tweaking my cooking technique before giving up on a new food. That said, we've mostly ditched reduced meat in favor of the two things Joey recommended above --- pastured meat from a friend's farm combined with deer we hunt out of the woods. Maybe by this time next year we'll be trapping rabbits too! Powered by Branchable Wiki Hosting.